Hello metal clay beginner and welcome to the wonderful world of metal clay! Sit back, relax and find out all about this wonderful material here. So you’re a metal clay beginner interested in working with it but don’t know where to start. Well on this page you’ll find some basic information to get you going with links to useful documents and resources to help you. First, what is metal clay? It’s very simple – metal clay is a clay like material made up of fine metal particles, an organic binder and water. You can find out more on our What is Metal Clay Page. 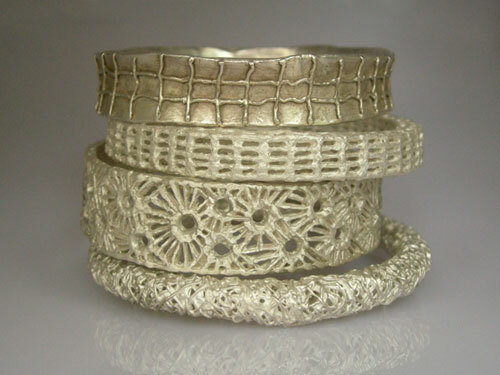 Silver metal clay is a greyish white color and comes in packets of various sizes, the largest being around 50 grams. There are two companies who have manufactured silver metal clay since the beginning; Mitsubishi who make Precious Metal Clay or PMC and Aida Chemicals who make Art Clay Silver or ACS. There are now more companies manufacturing silver metal clay but the original two are the most popular. This is a safe material for metal clay beginners to work with as long as you follow some basic rules. The metal clay comes in a variety of formats. The main format is lump clay. It also comes in pots in a watered down form called metal clay paste or slip. This is useful for sticking pieces of lump clay together. It can also be used to paint onto shapes – like pasta shapes, cereal, lumps of bread or twigs, leaves or flowers. Applying multiple coats of metal clay paste and allowing it to dry thoroughly between coats can result in a very light and beautiful fine silver item. You can buy the metal clay in a syringe. This is specially formulated to be squeezed out of the syringe in thin lines and make lovely patterns on the surface of the metal clay although metal clay beginners may find it a bit challenging. Finally there is a version called metal clay paper or sheet clay. This is a flat sheet of metal clay that can be cut with scissors or punches. In lump form, because this is a clay, you can work with it like clay – roll it out, push textures into it, cut it into shapes, squash it into molds, form it into shapes like animals or flowers – the possibilities are endless. This is the form that most metal clay beginners start with. Once the metal clay is dry, you can file it with emery boards or fine sandpaper, drill it with a simple hand drill and generally refine and clean your design. You then fire it using a domestic gas ring, butane torch or in a kiln. The binder burns off and the fine silver particles fuse together to create a solid fine silver item. This item will be 99.9% solid silver. In July 2008, bronze metal clay was released. This is much cheaper than silver metal clay and comes in larger packets – up to 300 grams. It has different requirements to silver metal clay, for instance it cannot be fired by torch or gas ring, it has to be fired in a kiln. Copper metal clay was launched soon after and also has to be kiln fired. Then in 2009, torch fireable copper clay was launched from two sources, Aida Chemicals and Hadar Jacobson. There is now Sterling silver clay, 950 or 960 clay and many others. There are new developments happening all the time so keep watching the Metal Clay Academy website for the most up-to-date news! How can the MCA Help? 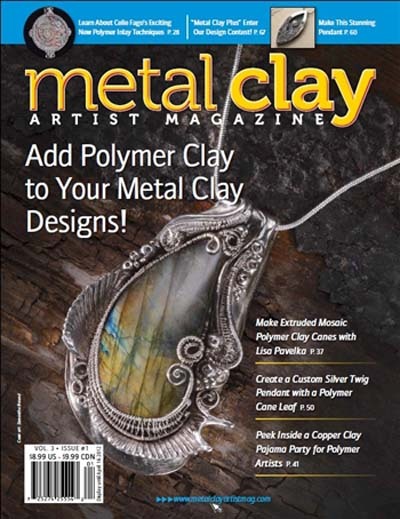 The Metal Clay Academy website has lots of information to help a metal clay beginner start working with metal clay. The information comes in a variety of forms. 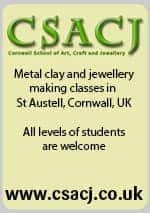 You can view videos of metal clay techniques, or browse online links to tutorials and information on here. Please have a look around the website or use the search function to find what you’re looking for. 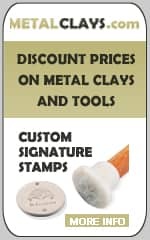 There are plenty of sources for metal clay tools and equipment and if you decide to do lots more work with metal clay you may want to buy some of them. When you’re finding out about metal clay, you can normally find enough items around your home to make some great things without the expense. What tools do I need to work with metal clay? If you already work with polymer clay, the tools are pretty much the same. If you are a complete metal clay beginner with no crafting experience, you can start using metal clay with minimal investment in tools. Silver clay is expensive but it’s not necessary to buy expensive tools to work with metal clay. If you’re just starting out, spend your money on a packet of clay and see how you get on. Here you’ll find some ideas for working with metal clay with tools you’ll find in your home already. It’s useful to have a smooth, non-porous work surface to work on when using metal clay. A plastic table mat is ideal. Or a piece of glass – maybe you have an old picture frame that you can take the glass out of and use. Smooth ceramic tiles are also good. Make sure the surface is glass, plastic, glazed ceramic or acrylic – not wood as this is too porous and may pull the water from your metal clay making it difficult to work with. Metal clay can be a bit sticky to work with so before you open the packet, make sure your hands and all your tools including your work surface have something on them to prevent sticking. The easiest thing for a metal clay beginner to use is cooking oil. Olive oil is commonly used but any sort of cooking oil would work fine. Very lightly grease your work surface, hands and roller before you handle the metal clay. If you use too much oil you’ll end up with a slippery mess so use the oil sparingly. And open your packet before you get all greasy! Keep your metal clay wrapped in film – you can use cling film or Saran Wrap for this – but remove it from the packet before lubricating your hands. If you read up about metal clay you’ll see some people refer to Badger Balm as a greasing agent. This is an organic hand balm with an oil base and works well. There’s no reason why any hand cream or oil shouldn’t be used as long as it is not petroleum based – like Vaseline – or has lanolin in. Some metal clay artists have had trouble using products containing lanolin while others use it with no ill-effects. To avoid problems, stick to olive or vegetable oil. Most people start by rolling out the metal clay and making small flat items. To roll out the metal clay, you need a smooth, rigid, non-porous cylinder about 6 inches long. Look around your home, you may have something suitable to start you off. A smooth pen would do. Or what about a straight sided glass? Or maybe you have a glass bottle of oil, vinegar or some other kitchen item that is a smooth cylinder shape. Bubble bath or bath oil? Or perhaps you have a glass or acrylic rolling pin. Look around your home and see what might fit the bill. Many metal clay artists use acrylic tubes to roll out their metal clay. In DIY or hardware stores you can buy long lengths of acrylic pipe of varying diameters. They are not very expensive and you can saw a length into six or nine inch sections using a hacksaw. This gives you lots of rollers, you’ll never run out. Or you could sell them to your friends for a small amount to cover your costs. Or maybe you already have an off-cut of acrylic pipe in your garage. To make sure that the rolled out clay has an even thickness, metal clay artists use guides on each side of the metal clay as they roll. The simplest guide used commonly is playing cards. A stack of playing cards each side of the metal clay allows you to roll consistent thickness of clay. In tutorials you often see instructions to roll a piece 3, 4 or 5 cards thick; they mean playing cards. If you don’t have playing cards, you could create your own rolling guides using cardboard. Cereal packets are very useful for this. Simply cut lengths of card from your cereal packet and use these to stack either side of your clay. The cereal packet may be a little thicker than a playing card but you can experiment with this to see what works. When you have rolled out your metal clay you’ll want to experiment with texturing it. This is where the fun begins. You can use pretty much anything to texture your clay. Make sure the item has some oil on it to prevent sticking. With some textures it’s easier to oil your finger and gently apply the oil to the surface of the rolled out metal clay, then press the texture into it than to oil the texture. Wander around your garden or a local park. Nature has many things that make wonderful textures – leaves, bark, twigs, grasses, seed pods, acorns, pine cones. The beach is a great place to pick up shells and bits of drift wood which give great textures to use with metal clay. Look around your home and see what you can find. Bottle tops and toothpaste caps often have patterns on them which can be pressed into metal clay or rolled on. Your children may have very interesting textures on some of their toys. Once you start noticing textures around your home and garden, you’ll find yourself seeing the potential for texture everywhere. Do you have a button box? Buttons are a great source of texture for metal clay jewelry. You can use them all over a piece or use a special pattern as a focal point for a piece. Fabrics also make good textures. Lace, leather, muslin, linen all work well. Fabric with an open weave can make great textures but may be a little more difficult to work with. Sometimes the metal clay can get stuck in the weave. Oil the clay and press the texture gently onto the clay so it doesn’t squeeze through the holes too much. Charity shops are a good source of cheap buttons and fabrics. Textured wallpaper is very popular and a trip round a hardware or DIY store can be a great inspiration. Most shops selling wallpaper are happy for you to tear off a small sample to take away free, so you can come home with lots of great textures. As these are paper, they may not last as long as some other textures but that’s OK, you can go back and get some more for free. Lightly oil the metal clay before using these textures. You can make your own textures very cheaply. Pencil erasers are a great tool for texture. They are easy to cut and carve using very basic tools. With a craft knife, cut shapes into the eraser, or use carving tools to carve out lines and designs. The small erasers that fit on the tops of pencils can make great little stamps for a simple design in metal clay. Wine bottle corks can also be carved to make interesting texture tools. Polymer clay is a great material to create your own texture plates. Flat, baked sheets of polymer clay are very easy to carve or you can push textures like shells into unbaked polymer clay, bake it and use this with your metal clay. It’s best to cut out your design after you’ve textured the rolled out metal clay. You can use all kinds of things to cut out designs. Wooden toothpicks are very cheap to buy and they are an invaluable tool for the metal clay artist. The simplest way to cut a shape is freehand using a toothpick. Maybe your texture will suggest a good shape or you can just cut an organic swirly pattern. Small cookie cutters are great if you have them around the house and are very useful if you want to make several things the same shape and size, like earrings. The stencil cutters with a whole sheet of different sized circles or squares for instance, are also useful. To use these, choose the size of shape you want to use. Using your playing cards or cardboard to support the stencil lay it gently over your metal clay and using a toothpick or cocktail stick, cut the shape using the stencil as a guide. Bottle tops can be used as metal clay cutters or you can cut around small objects with interesting shapes using a toothpick. You can also make your own stencils by drawing a shape on graph paper or tracing a shape from a book using greaseproof kitchen paper or tracing paper. Then using some cardboard – say from a cereal packet again – tape or glue your design to the cardboard and using a craft knife, cut the shape out of the cardboard. Clean up the edges and corners with your craft knife and you have a stencil to use with your metal clay. The simplest pendant or earrings are suspended on a silver ring, called a jump ring. While the metal clay is soft, you can cut a hole in your piece for the jump ring. The easiest and cheapest way to do this is with a drinking straw. Make sure you keep drinking straws when you’re out with your family so you have a variety of sizes. Keep an eye open for small ones which are sometimes used as coffee stirrers in cafes. To use a drinking straw, lightly oil the end and punch a hole in the metal clay using a slightly twisting motion. Lift it straight up and use a cocktail stick to poke out the plug of clay from the end of the straw. Sometimes you may not want to hang your piece with a jump ring. 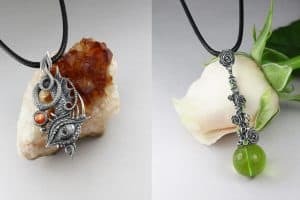 Another way to hang a pendant is with a wrap over bail. The bail is the part of the pendent that has the chain or thong go through it to hang the piece. 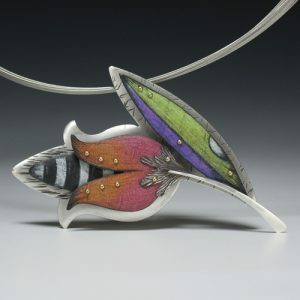 When you make a metal clay pendant with a wrap over bail, you cut it long enough to allow part of the pendant to be flapped over to the front or the back and stuck down forming a loop. To form the loop, use a drinking straw. Oil a straw and flap the metal clay over this to form the loop. Stick down the flap using a little slip – see next section – and make sure it’s well stuck down. Another way to make a bail is to cut a small rectangle of metal clay and stick this to the back of the pendant forming a loop. Once again, an oiled drinking straw helps to form the loop and can be left in place until the piece is dry. In both these types of bail, carefully remove the drinking straw by gently twisting it and pulling it out when the whole piece is thoroughly dry. If you want to stick one piece of metal clay to another you need to use water or clay ‘glue’, called slip or paste. You can make paste by breaking off small pieces of metal clay and squashing them down onto your work surface with a flat knife, like a palette knife or a flat piece of flexible plastic. Add a few drops of water and squash this into the metal clay, working it over the water until the water is absorbed. Add a little more water and repeat. Soon the metal clay will become runnier and you can then scoop it up on your plastic or knife and put it into a small container with a tight lid. Good containers for this would be old 35mm film canisters. These are getting more difficult to find now people use digital cameras more but you may be able to get some free from your local film processing store. Make sure you ask all your friends to keep theirs if they use film. Another good source of small containers are the individual portions of jam or marmalade that some hotels use. These little glass jars have tight fitting lids. Whenever you travel, don’t leave the jar on the breakfast table, take it with you, wash it out and use it for your slip. You can use a normal sized jam-jar if you have one or a small plastic box from your kitchen. Once you have a little fresh paste in your container, add to this to keep a good supply. Any small lumps of metal clay that collect on your work surface can be dropped into the slip jar and stirred in. When you file the edges of your dry metal clay pieces to smooth them, the filings can all go into the paste pot. Stir them in and check the consistency of the slip, add more water if necessary and it’ll always be there to use. To stick two pieces of clay together, paint paste onto the metal clay piece you want to stick on using a small paintbrush and gently press them together. If you find some paste squishes out the sides, use a clean, slightly damp paintbrush to lift this off. Metal clay needs to be thoroughly dried before finishing and firing. You can leave the clay out in the air to dry naturally or put it into an airing cupboard, a food dehydrator or next to the oven to speed up the drying. Blowing it with a hairdryer also works well. As long as it’s not too hot, it’ll be fine. Sometimes if you speed up the drying of the metal clay the surface can look dry but the inside or back are still damp. Carefully turning your piece over will help to speed up the drying and make it more uniform. Speeding the drying of metal clay by heating the piece can also cause flat pieces to warp a little. This can be resolved after the piece is fired (by gently hammering the piece flat) but if it’s very important for you to have a flat piece or you have stones in the piece that might be damaged by hammering, allow the metal clay to dry naturally and turn the pieces over regularly. Once the metal clay piece is dry, you can refine the edges with sand paper, emery boards, nail files or salon boards. These are great cheap tools and are very effective on dry metal clay. Be very careful when handling dry metal clay. It is very fragile and will break if you are rough with it. Smooth the edges of the piece with an emery board. You can smooth the inside of a hole in the dry metal clay or the inside of a bail using a wooden toothpick. The wooden toothpick is a tiny natural file and works really well on dry metal clay. You can also drill holes in your pieces when they are dry. Use a small drill bit in your fingers to drill a hole, the dry clay is soft enough to do this. Alternatively, a sharp pointed craft knife makes a great drill. With your metal clay piece flat on the work surface, hold the knife or drill bit upright at right angles to the surface, with the point down where you want the hole. Don’t press, just turn the knife or drill round and round so the point drills into the clay until it goes right through. Go slowly and be patient. If you press down, you risk breaking the piece. As long as you can see dust coming from the hole, you are drilling. Remember, metal clay does not become smoother or melt during firing – unless you over heat it! Whatever you see on the clay in the dry stage is exactly what you’ll see on the fired silver. If there are any dents, chips or bits you think are not smooth, they will look like that when it’s fired. It’s worth spending time in the dry stage to get the piece looking good. The simplest way of firing the metal clay in your home is to use a gas ring. You’ll need to buy a small piece of steel mesh to support the dry metal clay on the ring. Have a look at a tutorial on how to fire metal clay using this method. You can also use a butane torch. Some people use these in the kitchen so if you have one, you can use it to fire your metal clay. Some metal clay teachers offer firing services for a small fee. If you’re not keen on firing the piece yourself, it’s worth finding out if there’s someone in your area and getting them to fire your metal clay pieces in a kiln. Once your metal clay piece has been fired you’ll find the surface is a white color. This is the natural surface of the silver – all hills and valleys at microscopic level so it doesn’t reflect the light. There are various ways to bring out the shine. The easiest is to burnish the piece with something steel. A teaspoon or small, blunt knife would work well on the edges or any raised areas. Simply rub the teaspoon along the edge and you’ll see the silver begin to shine. If you have a piece with deep textures, it will be more difficult to get into these areas with a flat tool and you risk scratching the surface. A small stainless steel or soft brass brush is the best thing to use in this case. They are fairly cheap to buy.